This spacious semi-detached holiday cottage is attached to the farmhouse on a small working farm and livery yard on the edge of the village of Potterne. 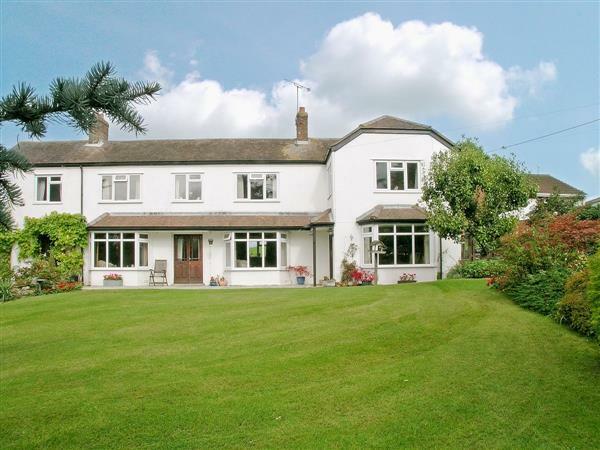 It is situated on a peaceful bridleway with glorious views towards Salisbury Plain. Visit Stonehenge, Avebury and the lovely National Trust village of Lacock, all only 20 minutes away or Longleat, Bath and Salisbury within ½ an hour. The New Forest, The Cotswolds and Glastonbury are approx 1 hour’s drive. Village shop ¾ mile, post office and pub ½ mile. Ground floor: Living/dining room. Kitchen. 1 single bedroom. First floor: 2 double bedrooms (one 4ft). Bathroom with shower over bath and toilet. Oil central heating included. Electric, bed linen and towels included. Video. DVD. Stereo/CD. Microwave. Washing machine. Fridge/Freezer. Shared garden. Patio and furniture. Barbeque. Ample parking. No smoking please. NB: There is a small ornamental pond in the garden. Holidays at Abbotts Ball Farm Cottage run from Saturday to Saturday. For a better idea of where Abbotts Ball Farm Cottage is, you can see Abbotts Ball Farm Cottage on the map below. Abbotts Ball Farm Cottage is in Wiltshire; should you be on the lookout for a special offer, you can find all the special offers in Wiltshire. It's always worth checking to see what is on offer at the moment. Do you want to holiday near Abbotts Ball Farm Cottage (12707), you can see other cottages within 25 miles of Abbotts Ball Farm Cottage; have a look to find your perfect holiday location.